Intelligent Mexican Marketing, a fast growth brand building and direct store delivery distribution company, talks about their fast growth and how KPI Online helped them with their data needs. Learn how to use our Excel templates to format your data and upload the data to your KPI Online dashboards. Learn how to use our data connectors to upload data from the most popular ERP or accounting systems to your KPI Online dashboards. Learn the basics on using a Business Intelligence dashboard to view, analyze and compare your business data. Here we get into the meet of KPI Online. Learn what you can do with the Revenue dashboards and how it can help you analyze revenue and more. 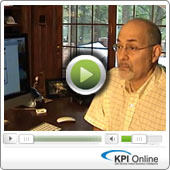 Learn what you can do with the KPI Online Expense Dashboards and how they can help you reduce expenses and more. This video takes you to the next level and shows you how you can customize your dashboards to perform the analysis you want. Find out how to analyze your data so you can find previously undiscovered threats and opportunities.